Two men remain under police guard in hospital today after a car crashed into a house in Leeds. They were among five people arrested in the wake of the collision, which happened in the early hours of Saturday morning. 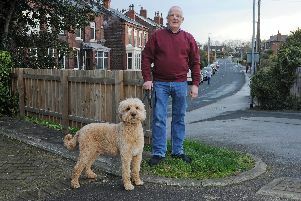 Resident Andrew Anderson, 52, described how he woke up to an “almighty bang” as the blue Volvo V60 crashed into his home in Tempest Road, Beeston. Firefighters freed four people from the wreckage, before the group were arrested on suspicion of conspiracy to commit robbery along with a fifth suspect. West Yorkshire Police has now issued an update on the progress of the investigation. A spokesman said: "Two men, aged 31 and 39, who were arrested at the scene on suspicion of conspiracy to commit robbery, remain under police guard in hospital. Their injuries are serious but not life-threatening. "A 37-year-old man, who was also arrested at the scene and treated at hospital, was later released under investigation. The two women who were arrested were released without charge." Officers from Leeds District Crime Team are continuing to make enquiries but have now traced two people who were thought to be key witnesses. The spokesman said: "The occupants of the white van that were involved an altercation with the blue Volvo in Beeston Road prior to the collision have now been traced."